You seek freedom, somewhere peaceful to calm your senses and hear your inner voice. Have you been feeling stressed and disconnected? Do you feel unsure of your path ahead and crave time alone to think? As this cloudy stone suggests, your vision is obscured by the hum drum of daily life and some alone time is called for. It’s not necessarily that anything is ‘wrong’ with your life, but perhaps you feel it is running you rather than the other way around. As we approach the dawn of a new year, find time (if just for an afternoon) to assess things. You may discover when you think about your goals, you are in fact moving successfully towards them. When we spend quiet moments in contemplation the vibration of our body changes. It allows inspirational thoughts to pop into our head out the blue (this stone is associated with angel communication). Deep down you sense a connection with the ‘other side’, and they are waiting to talk to you and give you guidance. If you are attracted to this stone, you are (or are about) to go through a major life transformation. This transformation may be practical, changing the way you live and work, but it also goes much deeper. It is about spiritual evolution, energy blockages in your mind and body from past experiences being untangled and released. You are becoming wiser and in the process learning to truly value yourself. You may find the process unsettling, initially you become more aware of what you don’t want, rather than what you do. That’s fine. First we must acknowledge the need for change, only then can we start to look for alternatives. Malachite is the stone of prosperity and abundance, when you start to look up, luck and fortune are waiting. It can signify the end of destructive romantic relationships and the dawn of pure love. By picking this stone you are unconsciously telling the Universe, ‘I am ready for success. I am ready to lose the negativity. I am ready to be passionate about my life’. This is the stone of closure. If you chose it your unconscious is saying ‘I am ready to break out of negative habits and become happy’. You are becoming grounded. Like a sudden revelation you can finally see that others are not more fortunate or more lucky than you. They have their problems too, although they choose not to show them. You ARE what you feel. Jealously, bitterness, feeling of being cheated by life, these emotions poison our system and lead to a downward spiral of misery. We only hurt ourselves. Fortunately, energy blocks in your system are disappearing speedily. At last you find the willpower to break free of negativity (and perhaps negative situations or people) and embrace peace. As 2014 begins expect to feel expectantly happy in your skin. The breakthrough is realizing that the only path to long-lasting happiness is appreciating what you have, rather than what you don’t have. If you are attracted to this stone you have been receiving messages from the ‘other side’, either in the form of dreams, thoughts out of the blue, visions or seeing repetitive numbers or words. You are being intuitively guided in a certain direction – acknowledge your intuition and listen to it. It knows without thinking – it is your short-cut to success. If you’ve had trouble sleeping it may be you are ignoring a gut feeling about someone or some situation. By acknowledging and going with the flow, spiritual breakthroughs will occur. You are not alone, you are never alone in this journey. The Howlite crystal is a message from the world of spirit that a new spirit guide awaits you. Your guide plans to elevate you to levels beyond your wildest dreams. All they ask is that you believe in them, and take their hand. 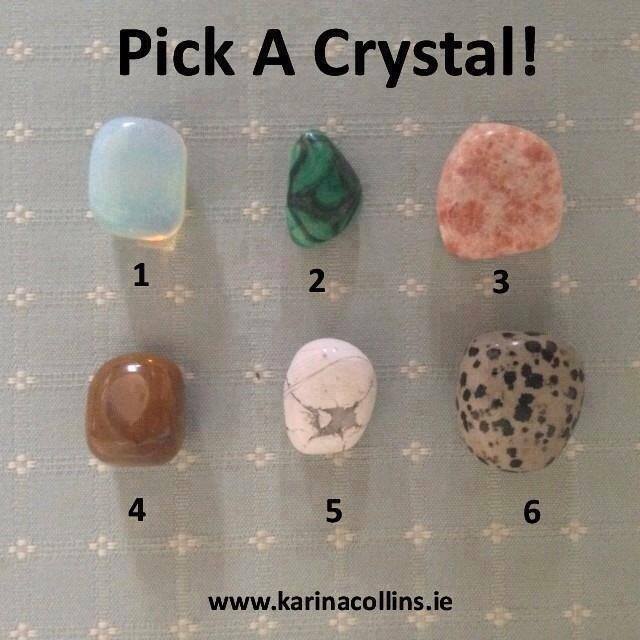 Which Crystal did you pick, did it make you think and is it accurate to where you are right now in life? Please leave a comment below!